The density of distribution of impurity-charge carriers, previously difficult to detect, can now be analyzed in detail. The brighter the image, the higher the conductivity. Toshiba Corp. today announced that it has achieved a breakthrough in imaging electron-carrier paths and impurities in semiconductors that allows analysis at the 1-nanometer level for the first time. This major advance, based on scanning spreading resistance microscopy (SSRM) is an essential step toward achieving LSI at the 45nm generation and beyond. Toshiba will introduce its breakthrough approach at the International Reliability Physics Symposium (IRPS), the international conference on semiconductor reliability, which is now being held in Phoenix, Arizona. Toshiba will present the results on April 19th (local time), the last day of the conference. Scanning spreading resistance microscopy (SSRM) is a preferred technology for two-dimensional profiling of localized resistance on a semiconductor cross-sectional surface, allowing analysis of the distribution of electron carriers and impurities. The demanding tolerances required for 45nm generation LSI makes it essential to understand electron-carrier density in the carrier channel, and to be able to control doping with 1nm-level precision, as slight differences in electrical characteristics can lead to increased current leakage and risk of short circuiting. SSRM uses a scanning probe to produce two-dimensional images of carriers in semiconductor device. These images reveal impurity induced resistance variation and allow analysis of electron-flow paths. However, the level of precision and repeatable generation of high resolution SSRM images with conventional available probes has remained at around 5 nm. Problems with SSRM stem from two sources: degraded imaging accuracy due to the influence of water vapor on the sample: and the difficulty of controlling a sufficiently stable contact between the sample and the probe. To overcome these factors, Toshiba installed the SSRM in a vacuum environment and refined the positioning of the probe. 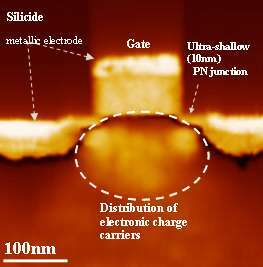 This allowed the company to optimize performance and advance to the 1nm level, the highest precision yet achieved. Toshiba has already applied this breakthrough to LSI development with 45 nm generation process technology.